Sam moors the Carpe Mañana on the property of the Black Swan, a dilapidated hotel owned by a former software guru, Christian Fey, and his two children, Anika and Axel. A murder and an impending hurricane throw the novel into high gear. Sam tries to figure out who committed the crime as law enforcement officials get attacked on the largely unpopulated island. Knopf succeeds in creating a crackerjack ensemble cast. Despite this being the fifth novel in the series, the allusions and clues as to what happened before in Sam Acquillo’s life remain clear enough to not impede on the action and suspense. I am an avid fan of Andrew Vachss’s Burke series and enjoyed getting introduced to another ensemble of characters. The witty banter between Sam and Amanda reminded me of the quippy repartee of Keith and Veronica Mars on the TV series of the same name. Sam is a complex character, a wonderful balance between brains and brawn. A graduate of MIT, he worked on computer systems on offshore oilrigs, and spent time as a boxer. He currently spends time as a carpenter and chauffeuring the sailboat of a wealthy benefactor to Connecticut. That was the plan before the storm blew them off course. Amanda is supposedly a real estate mogul but spends her time as the Nora to her Nick Charles. And like Nick Charles, or, in the parlance of our time, the Dude, there isn’t a vodka on the rocks Sam doesn’t like. Knopf mixes together seamless plotting, compelling characters, and literary bravado in a potent cocktail. The smartassery of Sam Acquillo shines through in his dialogue with other characters and his perceptiveness. The crux of the story rests on the Fey family and Subversive Technologies with its upcoming release of N-Spock 5.0, a game-changing analytical software. There’s only one problem: every time Subversive tries to run N-Spock 5.0, the program crashes. With investor money on the line, Subversive Technologies seeks to take matters into their own hands. This includes sending mercenaries to “persuade” Axel Fey to fix the program, since they assume he wrote it. Years ago, Axel and Anika played around the Subversive offices because of their father’s work. Black Swan is the name of the rundown hotel, but it is also a term for a paradigm-shifting event. N-Spock 5.0 is a black swan with its potential next generation capabilities. It is something that will change the landscape of computing forever, if Subversive could only get it to work. A hurricane isn’t weather, it’s a thing. A monster that invades, ravishes, then moves along. It doesn’t care what it does to you, nor to itself, as it dies in soggy exhaustion deep in the mainland, or frozen to death in the North Atlantic. All it knows how to do is feast on warm water, curl into itself like a cobra, gather speed and strength to better lay waste all within its swirl. It’s a hungry thing, an indiscriminate beast, blind and relentless and ultimately doomed, but impossible to ignore, foolish to deny. Describing the amorality, destructiveness, and power of the hurricane read like a passage one finds in the philosophical writings of D.A.F. de Sade. The occasional passages of polished description raise the story above the garden-variety crime thriller that floods the market. 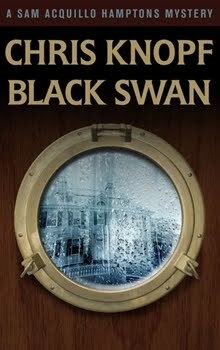 Black Swan spins a tightly plotted thrill ride around beautiful writing and characters you end up caring about even after the story ends. A wonderful review that cuts to the heart of this novel. And your excerpts underscore the richness of language that Chris Knopf uses; the poetic sensibility that he possesses. As his publisher, I hope I haven’t damaged his career by talking about this poetic element since, to many, poetic license and mysteries seem incompatible. But I do treasure his writing because of it.